All bees in a single colony are related. The queen is the only bee that lays eggs, so she is the mother of all bees in a nest. She can lay up to 1,500 eggs per day depending on how much food workers provide and how much space is in the nest for new brood. Queens have the ability to lay both fertilized and unfertilized eggs. Sperm is stored in a special organ and released throughout her life. Fertilized eggs develop into female bees while unfertilized eggs become males or drones. The only purpose drones have is to mate with a queen. Mating occurs away from the hive and after a drone mates, he dies. Genetic diversity is important for the survival of a colony. Queens achieve diversity by mating with an average of 12-15 drones during their nuptial flights. 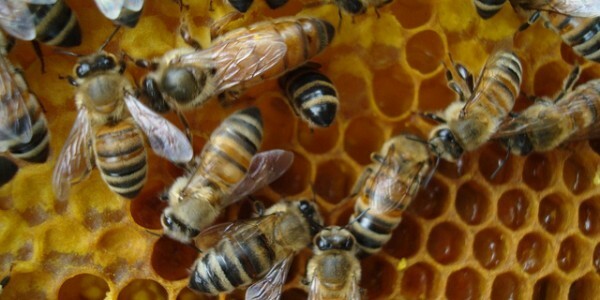 Colonies with a queen that has mated with a number of drones are more likely to be healthy and survive than are colonies with queens that have mated with fewer drones. The more “fathers” a colony has, the more genetically diverse the bees of that colony will be, better protecting it from disease and other threats.